Find cool local shops, foodie restaurants, concert halls and African American history in this rapidly developing downtown zone. Delve in to African-American history and a cool shopping and food scene in one of DC’s oldest neighborhoods. The site of businesses, theaters and rowhouses since the 19th-century, the Shaw neighborhood is situated east of the U Street corridor, famously known as “Black Broadway” thanks to still-in-business spots like the Lincoln Theatre and the Howard Theatre. It was there, in the early 20th-century, where acts like Cab Calloway and Pearl Bailey once played. Today, both theaters still host a range of musical artists; a statue of native son and bandleader Duke Ellington playing the piano sits in from of the Howard. Nearby, the legendary 9:30 Club hosts rock and alternative acts in a two-level, warehouse-like space. 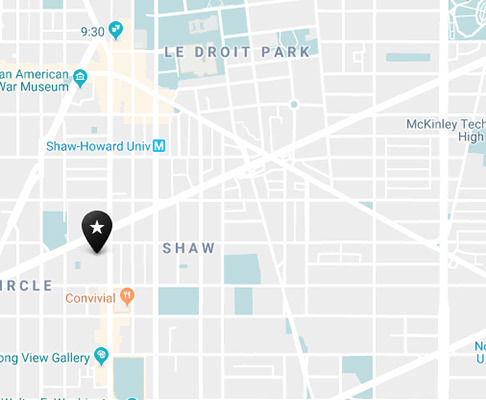 Shaw is now one city’s hippest up-and-coming neighborhoods, with attractions like the shops and eateries at The Shay and the Atlantic Plumbing complexes and bustling cafes like Compass Coffee and La Colombe. Shopping also booms here, primarily in indie and chain stores near U Street, where choices include DC’s only Steven Alan outpost, for his-or-hers edgy fashion. The southern end of Shaw gives way to high-end shopping mecca CityCenterDC and the retail-filled Penn Quarter & Chinatown neighborhood. The dining and bar scene in Shaw sizzles, with new spots opening up on 7th and 9th Streets and in the neighborhood’s quirky, historic alleyways. Happy hour at Dacha Beer Garden, a dog-friendly brewtopia and cafe pouring German, Belgian and American suds, is a must. Hot tables include Espita Mezcaleria for inventive southern Mexican cuisine, The Dabney for Mid-Atlantic seafood and southern sides cooked over a wood fire and The Red Hen for wood-fired Italian cuisine in a rustic, homey environment. You can also savor fresh baked treats, including cookies, cakes and confections, at Buttercream Bakeshop, the acclaimed flagship bakery of award-winning pastry chef Tiffany MacIsaac. Spend the day with former Top Chef finalist Marjorie Meek-Bradley as she shares what she loves about the neighborhood, digs into killer breakfast sandwiches and visits a mezcal mecca. Espita Mezcaleria for all things mezcal, flicks at the Atlantic Plumbing Cinema, drinks at the Columbia Room, shopping at The Shay, Right Proper Brewing Company's hilarious mural art on the walls, bringing their dog to Dacha Beer Garden. Metro’s Green and Yellow lines service the area, with stops at both U Street and Shaw-Howard University. Numerous city buses stop here as well, and the area is highly walkable. Shaw is hip, trendy and edgy. From the live rock and roll music to the African-American Civil War Memorial, you’ll get plenty of excitement and culture here. Click to learn more about what’s happening in this hip neighborhood.